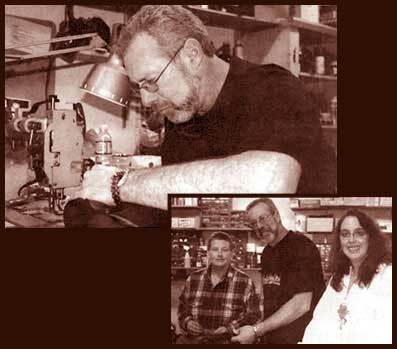 A business built on a passion for working with leather is turning 25. When Andrew Gilkerson started Ace Leather Goods in 1982, he didn't know that his business would still be a success story 25 years later in a time when local craftsmanship seems a dying art. "I can't believe it's been this long," Gilkerson said. But his talent has brought him a long way. Gilkerson began to work with leather at age 15. By age 17 he was the production manager of a leather business in California and after a while had gained enough knowledge and skill to start his own leather business. Starting out with wholesale work, Gilkerson and wife Kathy today offer more than 100 products in various colors and designs and have about 7,000 customers on their e-mail list. They have their retail store in Langley on Second Street and travel to many arts festivals throughout the Northwest. The success secret may be their outstanding customer service. "We find it very important to provide our customers with new designs and patterns in both soft leathers and tooling leathers. From listening to their suggestions, we improve products we are currently making. This keeps us so busy we no longer have the time for custom-type work," he said. "If you listen to your customers, you make something that's beautiful and functional," Gilkerson said. All their creations are made by hand. "Our products are second to none," he said. Gilkerson works long hours in the workshop, producing an array of leather items with great attention to detail and consistency and a keen sense of creativity. Wildlife designs such as eagles or deer are stamped onto leather wallets, or metal details are added to accent belts before hand finishing. Belts and wallets are painted with coats of dyes before they are sealed with wax. The Gilkersons also dye their own leather. At their workshop just outside Langley, the Gilkersons use more than 3,000 hand tools as part of their year-round work. In January and February, they usually focus on repairs and designing before the arts festival season kicks off again and sends them traveling. Buying a handmade belt or purse is more expensive than a bag bought at the mall. One reason is the labor-intensive workmanship, but also the cost of leather has increased significantly over the years and the medium is unforgiving as a bad cut can't be fixed. But a leather purse or wallet from Ace is a good investment. "That's our only problem," Gilkerson said with a smile. "Our products last too long." Gilkerson said shops like his are becoming rare. "We need to support what's made in this country," he said. "U.S.-made products become extinct." He has a team of three to six people. An undeniable presence in the business is Kathy who has been on his side for more than 20 years. "I couldn't do it without her," he said. Laura Love and Tracy Nance round out the core team. Gilkerson is proud of his crew. Finding people that share the same passion for his work is rare. "For a long time, I didn't trust anyone to do it the way it had to be done," he said. The Langley store will be hosting a special anniversary sale. All products are 25 percent off for 25 days. You can visit Ace Leather Goods on the Web at www.aceleathergoods.com, or stop by their store at 220 Second St. in Langley Village.